Bodet Campanaire certified EPV Label ! Bodet Campanaire is proud to join the EPV Entreprise du Patrimoine Vivant network (Living Heritage Companies). This label is recognition of the company’s involvement in bell and clock restoration for over 150 years: Design, production, installation and maintenance of equipment. First major step: removing the bells. Her name is Louise Yvonne Marie and she left her bell tower in October to be restored and consolidated. She is one of the bells from the church that was showing signs of age. 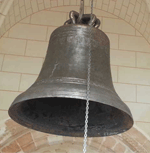 In the small village of Assigny, Bodet worked on a project to restore the three bells from Assigny church. A makeover that will enable the village to return to normal life. • Bodet Campanaire certified EPV Label !